I'm calling 5 out of 9 a big success for me. They were all quite small finishes, but some were very time consuming. 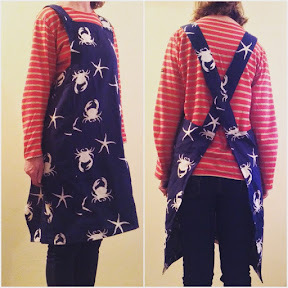 This apron was made using the cross back apron pattern on the Purl Soho blog. I used some beautiful linen that I bought in a charity shop in Sweden. So it brings back very happy memories of my trip last year. My round zip pouch finally got some binding and a cute charm. This is all hand stitched so it was something different and I'll probably make another in a similar style. 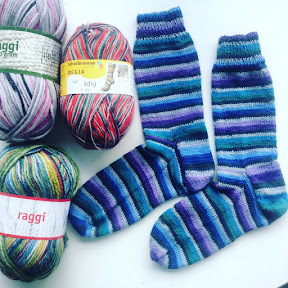 The socks that took forever .... About 5 years! But I love wearing them, so I've already bought more wool. This fabulous thread catcher is from Poppyprint's book "Make it Take it" I love it and would like to make one for a swap too. 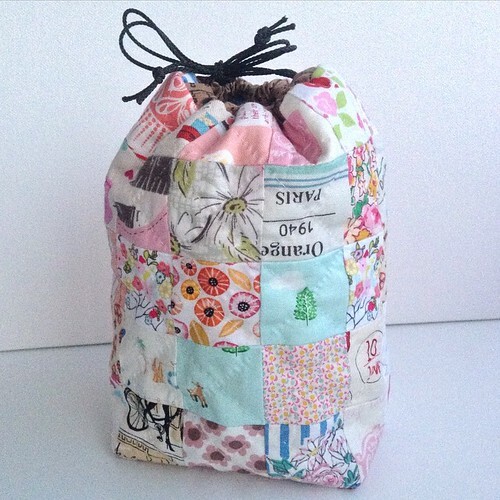 I used small pieces of all my favourite fabrics and stuffed with walnut shells .... Though I bought ground ones instead of crushed, so they are a bit fine. 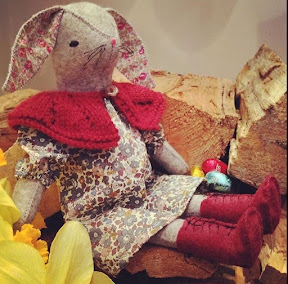 Then finally Miss Maggie Rabbit had a pretty Liberty dress - just in time for Easter. Well now I'm back from my travels around Scandinavia I've had time to fix my Blogpress account which wasn't working and finally do a blog post .... Just in case you are not on Instagram. 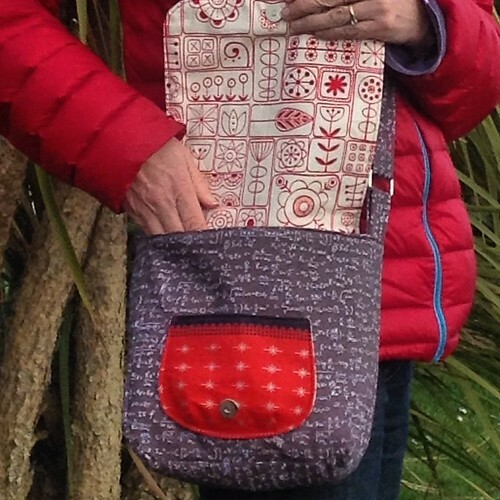 I've made a Bionic Gear Bag which is like a "go large" version of the Sew Together bag. The embroidered bee is from the "Little Quilts" book by Sarah Fielke and I managed to use up some of the beautiful vintage sheets from the swap organised by Mary Emmens. I added the Angelina fibre to the wings and it gives them a lovely shine. I'm not one for mini quilts as at the moment I've no wall for them, I prefer thinks that are useful .... Though Tim does now ask as to how many zip pouches do I actually need. But need has nothing to do with it, I just like making them! So my next one won't have a zip ... As this has 4 internal zip pockets. Next I plan to make a Japanese loop bag as I'm enjoying my Kantha stitching but that will be another post. I spent ages trying to decide on a binding and this was the best but as it was a fat quarter I didn't have a piece for the binding that was 24" and the pattern said to trim to fit the 22" zip, so I bodged it and trimmed the zip a little. I should have then put longer zip tab ends on but I'll know for next time. I also made tab ends for each of the zips, I will make them a bit longer next time too but they do reduce the bulk in the side seam and give the bag a lovely finish. 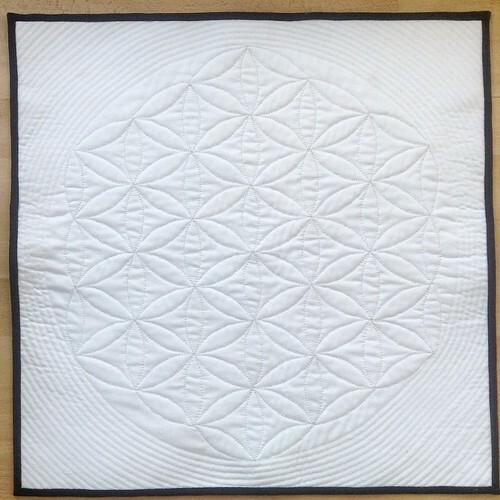 I found the free pattern for this "Flower of Life" quilt on Craftsy and knew that I wanted to make it for the Instagram Mini Swap. I originally thought that I would needle turn appliqué it, but it was taking too long and so I turned all the edges under and then machine appliquéd it. Raw edge with Bondaweb would have been much simpler and have a similar effect. I traced the leaves with a Frixion pen on sand paper to stop them wriggling around too much. When the theme of wood was announced we had just been Geocaching and I'd found this cute little wooden toadstool in one of the caches near to Stanton Drew, south of Bristol. In Geocaching, you can take something out if you leave something else behind, so we are leaving a variety of plastic zoo animals. If someone followed us around the same caches then they would have a whole set of animals. Stanton Drew has some standing stones and it's a lovely area to go walking, we saw honeycomb in a hollow tree that had come down with the wind....but Tim was stung by a bee before we had time to investigate it. 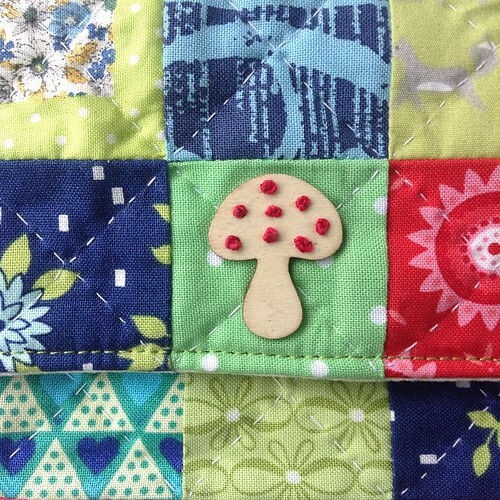 Anyway I thought the toadstool would look lovely on a scrappy pouch with some embroidery. 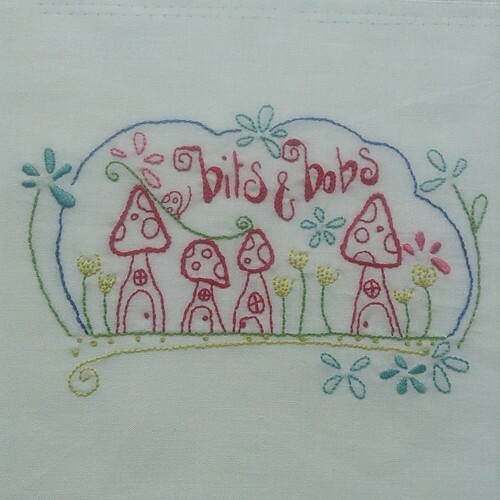 I've had the Cotton Floss embroidery book by Nathalie Lymer for quite a while, so I embroidered the toadstools, adjusting the pattern slightly as I don't like satin stitch. 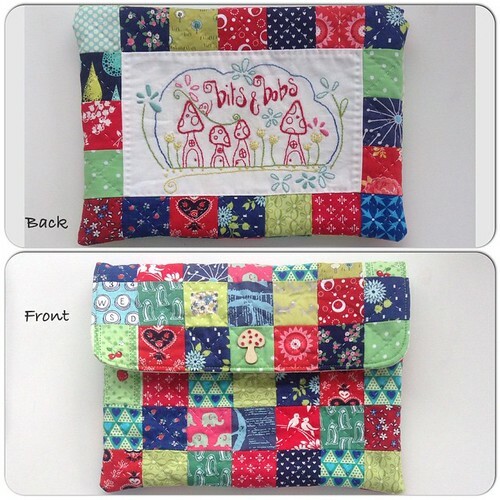 Chase has a lovely free pattern for a scrappy mini iPad pouch on her Quarter Inch blog so I based mine on that, but enlarged it slightly. I spent some time trying to get the scraps to look right, swapped a few in and a few out and eventually I was happyish. 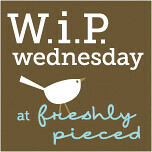 I find it quite hard get the scraps to play nicely together but I love the style. I enjoy doing the hand quilting which I marked out using the rounded edge of a metal knife as I've no Hera marker and Frixion pen leaves white marks on dark fabrics. The knife worked really quite well and I'll use the same next time. I put a dab of glue on the back of the wooden toadstool and then did some colonial knots through the holes to hold it in place. Unfortunately I snipped the corners off the outer pouch to make them neater when turning, forgetting that the hand quilting was fastened off in the corner, so hopefully a dab of glue will keep it from unravelling! 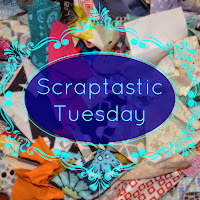 I'm also linking to Scraptastic Tuesday as this is such a great tutorial for using up 2" scraps. Sewing has been a tradition in my family for many years. My maternal grandmother was a tayloress and my mum is very good with a sewing machine too. They both had quite modern Singer machines for the time. My Grandma's machine had discs that slotted into the top to give a variety of different stitches. I still have it hidden away in a cupboard. That is unfortunately a tradition I've inherited is to keep everything, hoard it away ..... For just incase!!! !My mum made lots of my clothes and she would make soft toys to sell in my Aunts grocery shop, I especially remember the rabbits at Easter. 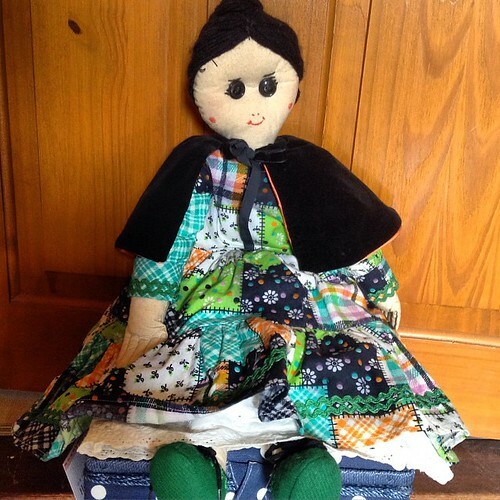 My Grandma made this doll for me about 40 years ago and my mum has just made me the rabbit that was in a recent edition of Love Patchwork and Quilting. My dad was a telecom engineer and my Granddad worked in Layland Motors making trucks. My mum also worked in a bank, Both were good at maths and very logical. 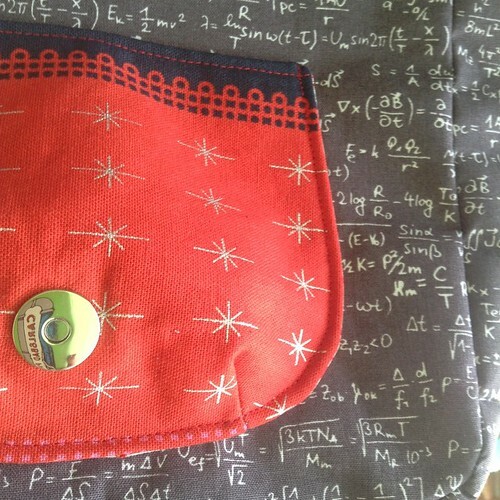 I have inherited from all a love of maths and sewing! So I've combined the two when I was pattern testing this bag for Katy. 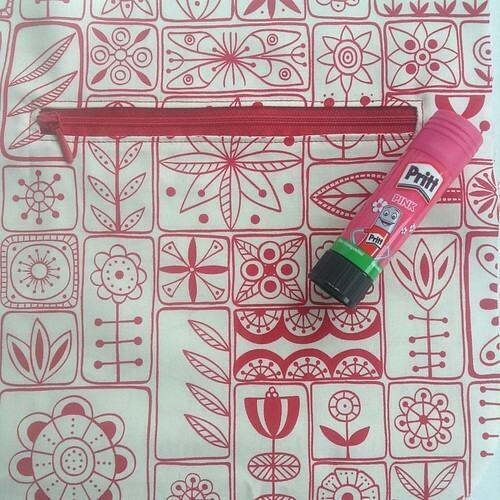 I love the maths print fabric which was from my LQS and thought it was ideal to make a messenger bag from, with a little Melody Miller to add some sparkle. The pattern was very easy to follow. I added an internal zip using Katy's tutorial and a longer strap as I'm tall and like to wear it across my body. 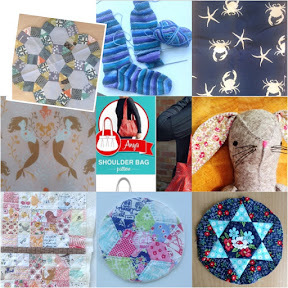 If you pop over to The Littles Thistle Blog you can see a whole variety of bags that the other testers made and there is a link to Katy's Pattern shop too. When the Le Challenge subject was announced as Passion for this month I immediately thought of Passion Fruit. Not having much fabric with passion fruits on them I thought it might be included on this Juicy fabric from Makower....there's everything there except passion which will have to be included in the Tropical fruits! 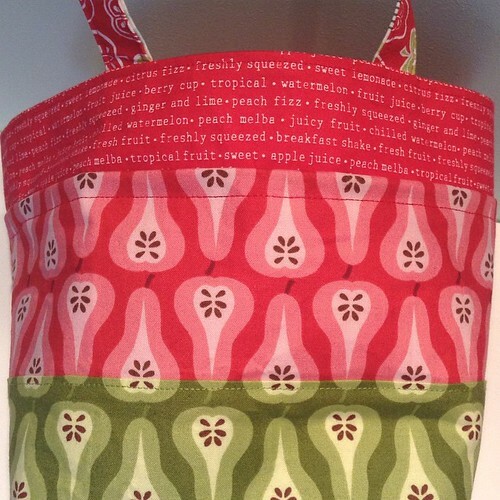 I though the Nicey Jane stripe fabric matched brilliantly and was great for the draw string cover. I save the cut off bits from when I boxed the corners to finish off the draw string cord. 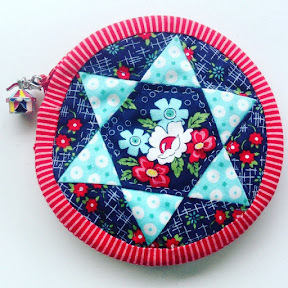 I made the bag for Jenny who is @patchworkmummy on Instagram as part of a #makeafriend swap organised by Di Willowbeck. 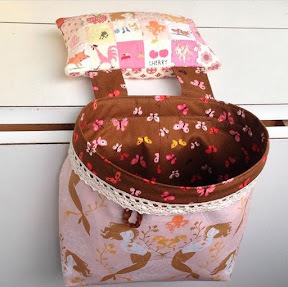 The free tutorial for this Bento Box lunch bag is over on Ayumi's Pink Penguin blog. 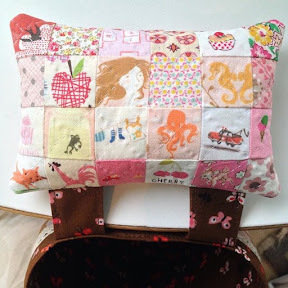 This is the third one of these I've made and I love the wipe clean oil cloth interior, though you can't see it in the photo I found some lovely Anna Maria Horner Loulouthi laminated fabric in House of Fraser that is ideal for these bags. 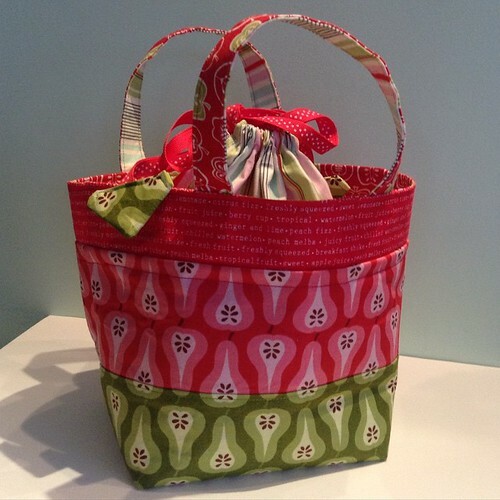 I also made Jenny a spring Kin-cha-ku bag from a pattern bought from Chase, 1/4" mark blog. I love hand quilting these and I'm hoping to build up a few pieced bag outers so that I can quilt them while we are away in our van. 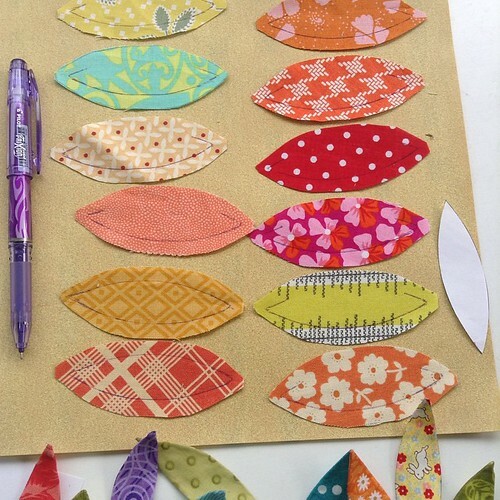 The Lecien cheater fabric is brilliant for this and complements the Bonnie and Camille Happy Go Lucky yellow squares. 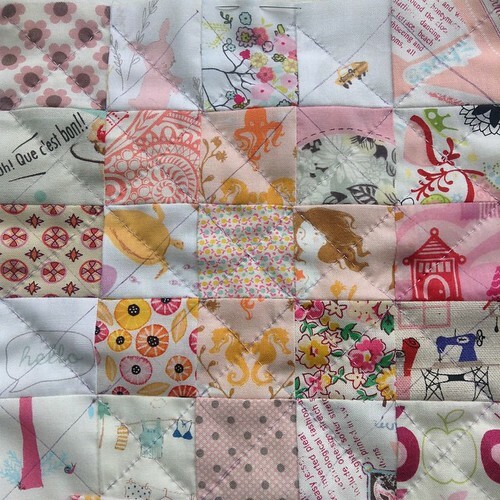 Jenny has just set up an online fabric shop "Sew Smile Fabrics " and has a lovely selection of Miss Kate and some Moda scrap bags at a great price. Both these bags were made from scraps that I have bought and that's why I had to do some pattern matching on the pear fabric but really happy how it turned out. 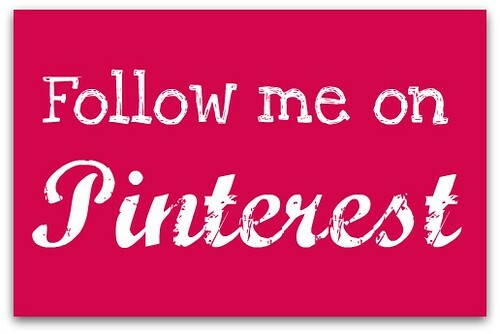 Linking up to Scraptastictuesday too. At the last meeting in Exeter of the South West Stitchers I saw Kerry had a beautifully made little draw string bag for all her sewing bits and bobs. 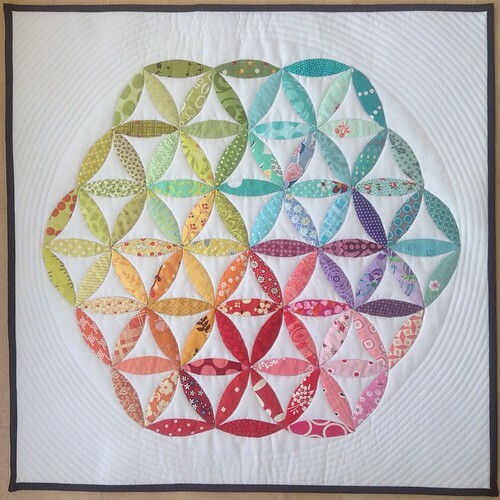 It was made by Chase from Quarter Inch Mark who also sells a pattern for the Kin-Cha-Ku in her Etsy shop. The pattern was well illustrated with lots of photos and very easy to follow. 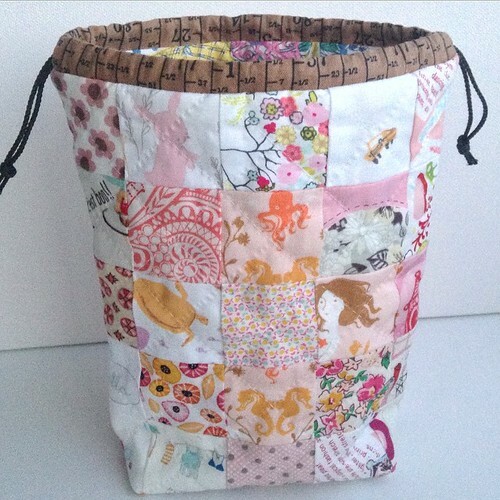 I love the fact it was hand quilted as this adds a lovely texture to the finished bag. I'm not sure how it ended up this colour as I started out with the scrap of the little deer and the Heather Ross mermaids. I put one row in upside down, but I left it as it was, as it was meant to be. 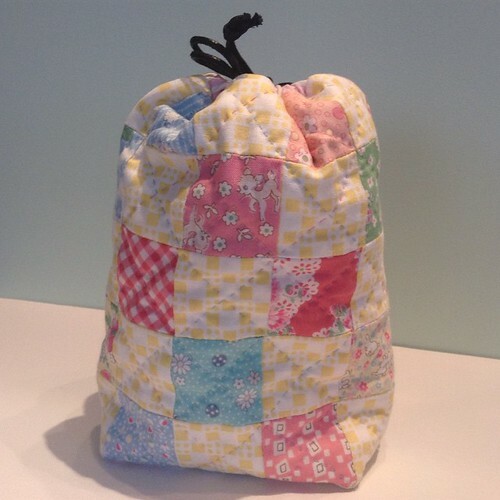 I quilted it with Coats Dual Duty Hand Quilting thread as it was available from Trago for a reasonable £2.95. Only when I got it home did I find out that it's not cotton, but a polyester blend. It looks ok though.